Marin County Parks has arranged to have IMBA trail builder Chris Orr in town next Tuesday and Wednesday to share more about how to maintain and care for our awesome bike park. Together with Marin County Parks we’ve done such a great job with phase 1, we need to be able to maintain all of the great work. Chris from IMBA will spend 2 days with us teaching sustainable practices and strategies to do just that. Discussion will be specific to a SLBP maintenance program strategy along with nearly 12 hours of hands-on maintenance skills development. Primary tool: Square point shovel, closed back. County Parks will supply tools to be used at training. This is a great opportunity to get dialed with what needs to be done and when, and learn the specific trail management techniques to help keep the park in a rideable condition for all our biking community. * Ideally you can attend both days, but we recognize that two days is a big commitment and people have day jobs. The presentation on Tuesday morning is chock full of information and there will be lots of opportunities to use that knowledge during the Winter and Spring months ahead. 8am – 12noon: Bike Park Maintenance Presentation (Lucas Valley office). 1pm – 5pm: On-site maintenance, Stafford Lake. 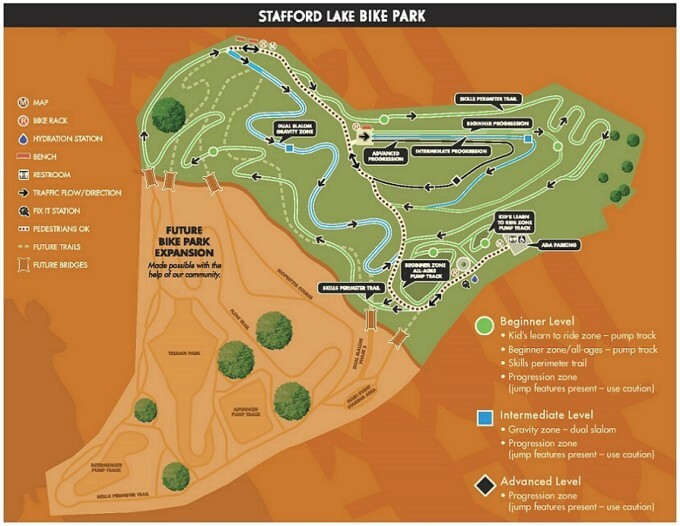 8am – 12noon: On-site maintenance, Stafford Lake. Who should attend: Trail builders, trail captains, those who like getting their hands dirty and using muscle. What to bring: Gloves, hat, a water bottle, appropriate clothing, and your enthusiasm. What to expect: IMBA’s best practices presented in detail to Marin County Parks’ staff and volunteers, including hands-on building and skills development at the bike park. Tuesday morning PowerPoint presentation will begin with coffee. Lunch provided both days upon RSVP. Benefit of attending: You know the techniques, the timing; you’re now a trail build lead alongside County Parks staff to care for our bike park. Ready to Train? Contact Kirk Schroeder, Marin County Parks Volunteer Coordinator: KSchroeder@marincounty.org or 415-763-2977. RSVP required by Monday morning (10/12). Let Kirk know if you can make both days, or only the first day.